The inscription is incised, in Roman font and has been left unpainted for a natural look. 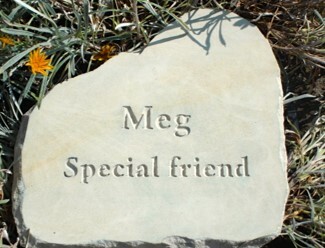 Molly’s pet memorial garden boulder made from limestone and “looking beautiful in the garden“. Ted’s Basaltic Column Pet Memorial “Ted’s memorial is just perfect….Am truly delighted with it, thank you so much ” Alison M., Cardiff. Limestone standing stone “It is beautiful, thank you so much” Chris & Steph C. Cheshire. 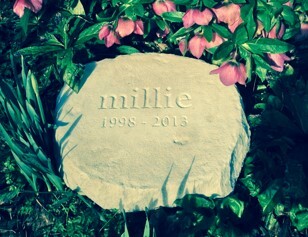 Hand carved sandstone column pet memorial “It is beautiful thank you so much ” Nina C ., Colchester. Percy’s Pet Memorial Limestone Obelisk.